You know that feeling when you feel a slight bit clogged down with clutter? You love the items, but just feel that need to find the perfect storage to place them in? Well, that’s how I am feeling..
At the moment, I love to have some more industrial and quirky style pieces in my apartment. 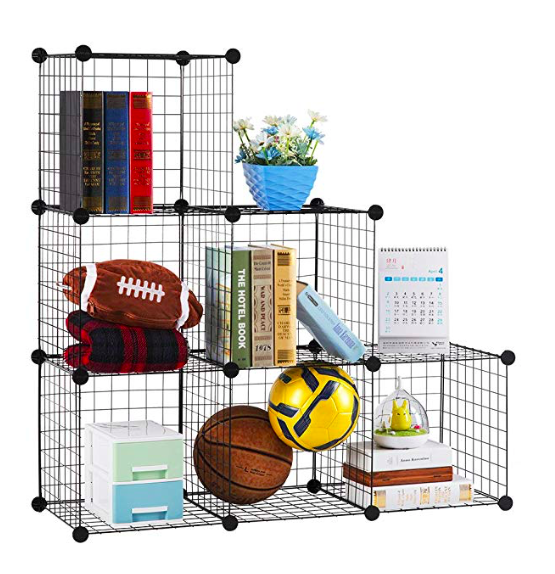 I was scouring the internet looking for my next idea to store things away in and I came across these..
Welcoming the DIY Wire Cubes. A 6 cube bookcase can hold up to 20kg, so you can store books, clothing, shoes, you name it! You can use the multi angle connectors to go wild and arrange these however you like. Whether they’ll be stacked, a standalone, or connected together.. If you are like me and love collecting little quirky knick knacks, then I thought this would be a great idea to store them and anything else that I need to around the apartment. From Funko Pops, to frames, large ornaments and statement pieces.. I feel like purchasing the larger set of these will get me even more freedom and to expand throughout different rooms! Eventually, I will get around to purchasing these but I wanted to share these with you all and see if any of you have had previous experience with this type of storage. I cannot wait to get my hands on them and start sharing some photos of the final outcome with you all. How do I currently store my things? I currently have an A Frame Shelf which I purchased from IKEA last year, which I painted black (it came as separate items, just arranged to make the shelf). It is one of my favourite items in my apartment as it’s really different, quite bold and displays my items so well. But as you can imagine, they have gotten a little crowded since I have accumulated a few more little bits and bobs along the way! So, where do you all like to find your home inspiration? I enjoy having a browse on Pinterest and then I head straight to Google to search for the most wanted products that I NEED! What is your current theme/trend that you have going in your place? I’d love to know more!